Chinggis Khaan Square honors the Great Khan of the Mongol Empire and includes a monument honoring Damdinii Sukhbaatar, one of the most important figures in Mongolia’s fight for independence. It is here where teams will set off on the penultimate Leg of The Amazing race Philippines. 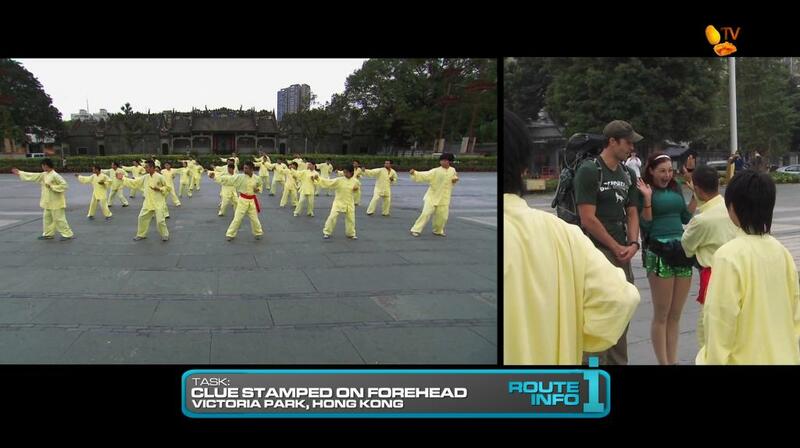 Teams open the first clue telling them to make their way to Hong Kong, China. 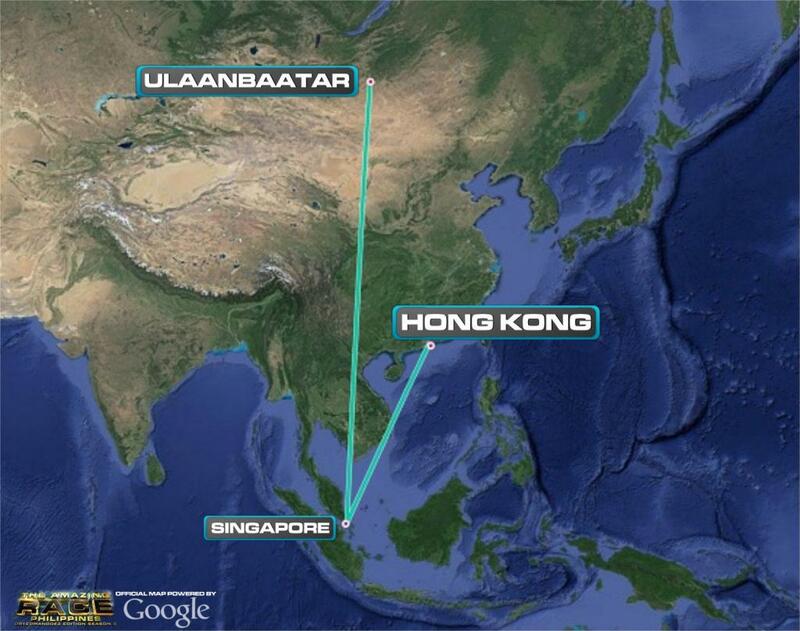 Teams must fly from Ulaanbaatar to Singapore, departing at 6:15am and arriving at 5pm on MIAT Mongolian Airlines. 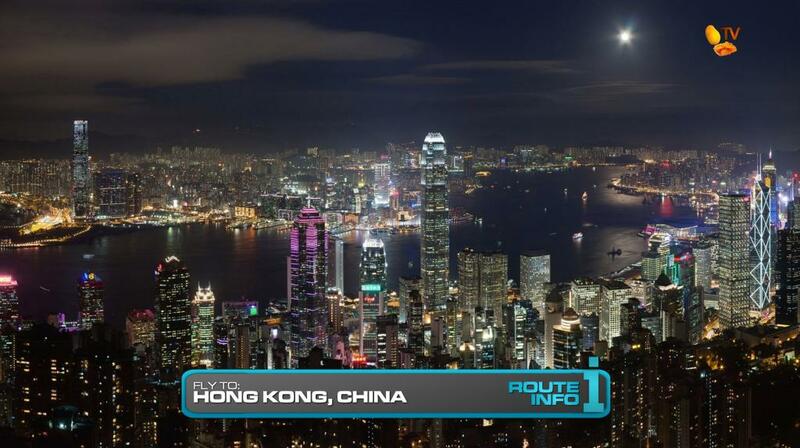 Teams will then fly on Cathay Pacific departing Singapore at 6:15pm and arriving in Hong Kong at 10pm. 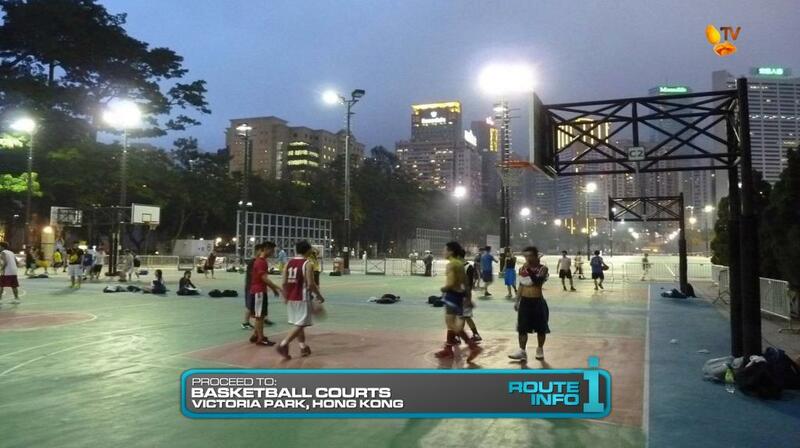 Once in Hong Kong, teams must take a taxi to the basketball courts at Victoria Park. There, one at a time, teams will watch a demonstration by martial arts students before the “master” will give them the next clue. What they don’t know is the Master will approach the team and stamp the name of their next destination (星光大道) on their foreheads. 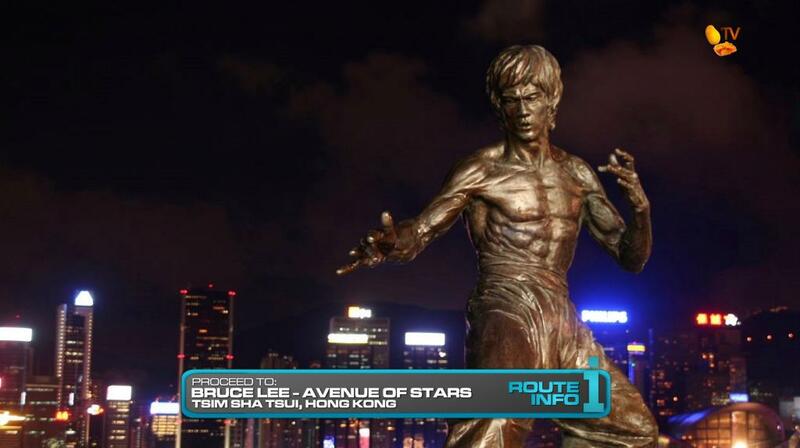 Teams must figure out their next clue waits at the Avenue of Stars (星光大道) next to the Bruce Lee Statue. 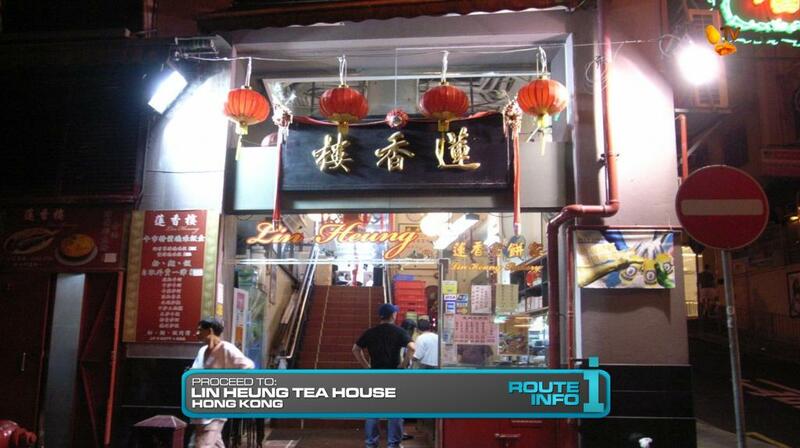 That clue points teams to the Lin Heung Tea House. 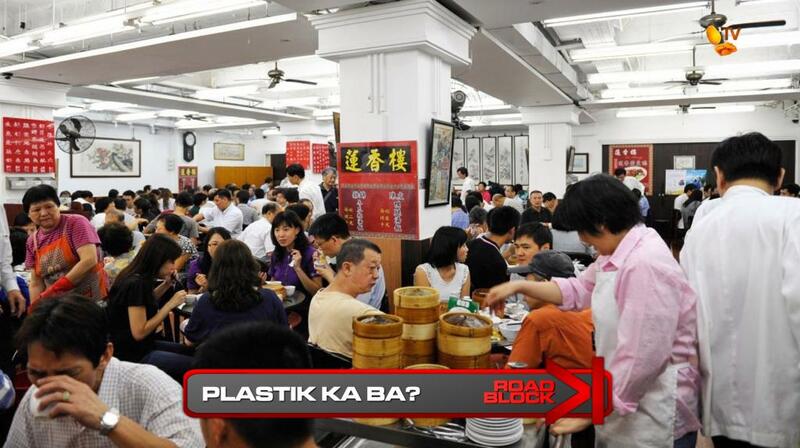 And at the Lin Heung Tea House, teams will find the Road Block: Plastik ka ba? 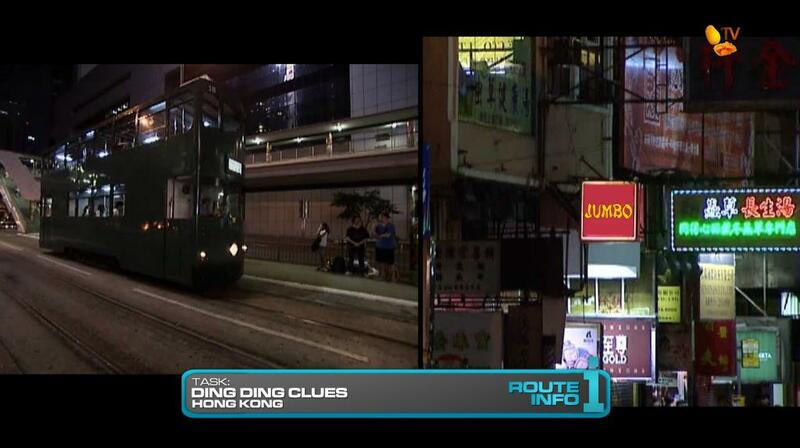 In this Road Block, teams must take a seat in this old fashioned Hong Kong restaurant and enjoy some authentic dim sum. Teams must find a fake piece of dim sum from the quickly moving trolley and against other patrons of the restaurant whom they will be sitting with. If teams pick a real piece of dim sum, they must eat it and wait for the trolley to return to their table. They can only retrieve one piece of dim sum at a time. Once they’ve found the fake food, they can exchange it for their next clue. 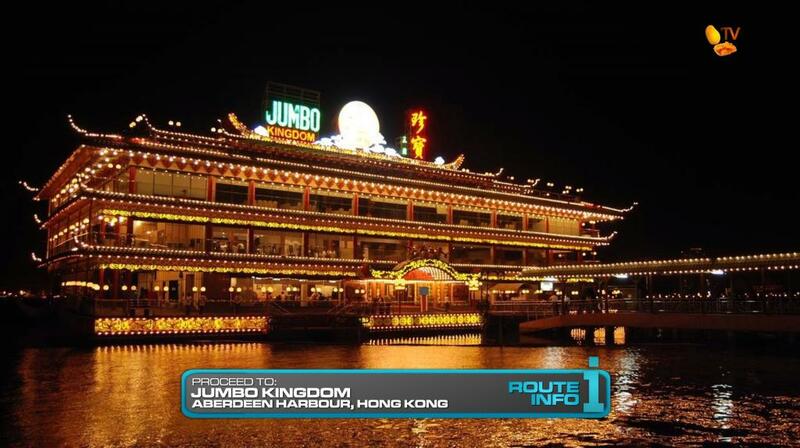 Teams must now head to Jumbo Kingdom for their next clue. 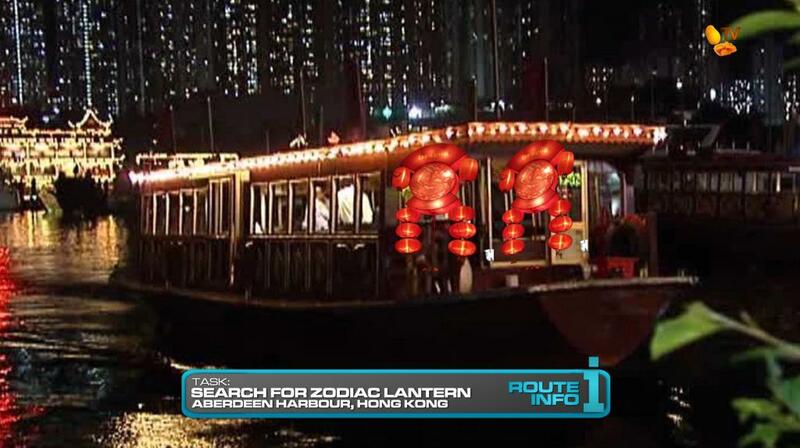 From Jumbo Kingdom, teams must hop onto a sampan and search Aberdeen Harbour for boats with illuminated lanterns, each with printed Chinese Zodiac symbols. Each team member must retrieve a lantern with their own Chinese Zodiac symbol and return to Jumbo Kingdom to receive their next clue. 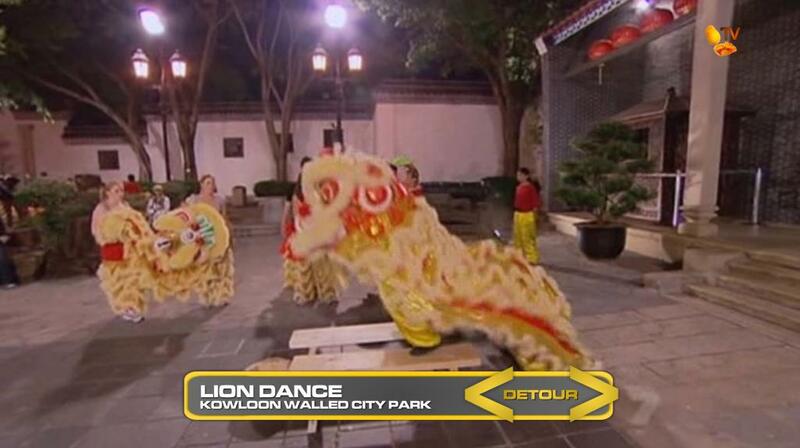 The next clue reveals the Detour: Lion Dance or Kung Fu Stance. In Lion Dance, teams will dress up and perform a traditional lion dance to the satisfaction of the lion dance master in order to receive their next clue. In Kung Fu Stance, teams will learn a series of precise Kung Fu movements to the satisfaction of a Kung Fu Master. 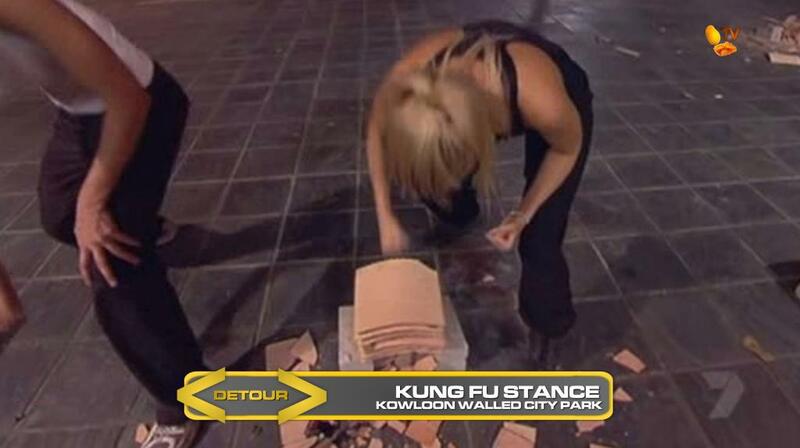 Then, each team member must break six clay tiles before receiving their next clue. 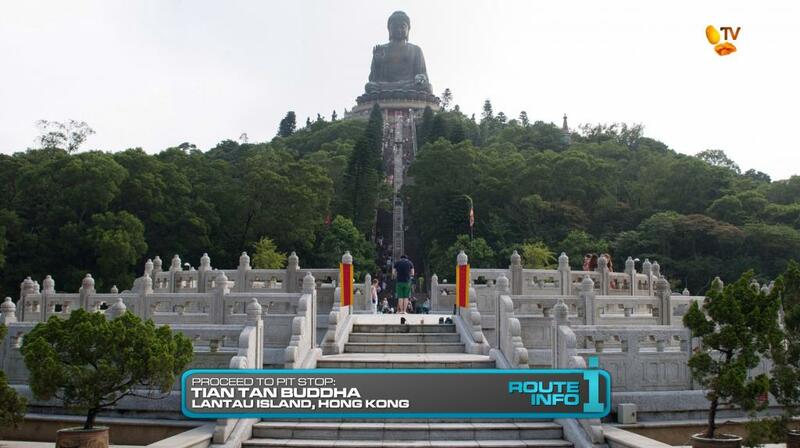 After the Detour, teams can now make their way to Tian Tan Buddha, the Pit Stop for this Leg of the Race. Teams are informed that they will be asked a question at the Mat before they can officially be checked in. 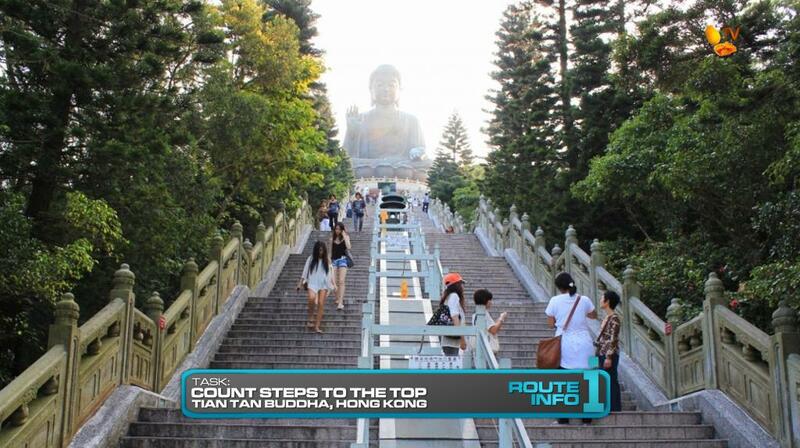 Teams must guess that the question will be: “How many steps did it take to climb up to the Mat in front of the Buddha Statue?” When teams give the correct answer, 268, they can officially check in. The first team to check in will win P100,000 from Shell V-Power Nitro+. And the last team to check in unfortunately WILL be eliminated. I really like this Leg. I always enjoy night Legs and Hong Kong is a great place to have one in. I thought that forehead stamp Route Marker in TAR24 was funny, so it should be fun here. And can’t have a Hong Kong leg without the requisite visit to Bruce Lee. The Road Block is a modified and recycled task from previous TARs. But in this one, it takes place in what is supposed to be a loud, crowded, but popular hole in the wall tea house. So that atmosphere should be very fun. Since this is the Penultimate Leg, it’s got to be a longer and a little more difficult. The tramways task from TAR17 was great, so it should be good here. And the early morning sampan rides should be great in the dark, especially since they’re supposed to be finding lanterns. Plus the Jumbo Kingdom at night as well. This was a fun Leg to put together just needing to figure out the perfect placement of tasks to allow for these tram and Aberdeen Harbour tasks to take place before sunrise. Which is why I needed that Singapore connection from Mongolia. The Detour is a TARAU1 recycle. And the Pit Stop should be very interesting. Is it fair for a team to lose out on the Final Leg just because they can’t count? Would that get people upset if someone lost just because they miscounted steps? That would be great drama! Lol I actually originally had the counting here first before deciding I needed an extra task in Siem Reap. Then reviewing this Leg, I wondered if I should include ANOTHER counting to the Pit Stop task. I was going to remove it since this is already a full Leg anyway. But then I thought, well, maybe the Siem Reap Pit Stop will get teams to think that the mystery question is counting. On TARAU3, the counting question came at a Route Marker that had no implication on the result of the Leg. At least not directly. And here, it is entirely possible that teams will be separated enough that it wouldn’t matter. In TARPH1, the Baguio Pit Stop already told teams they needed to count before stepping on the Mat and several teams messed up a number of times. So I’ll just leave this here. But I know if I had lost out a chance on the Final Leg just because I counted wrong, I would hate myself so much. And probably the show too. lol. An alternative would be to make this a surprise Non-Elimination/TBC/KOR/Superleg and employ the Final 4 Final Leg twist. But for my Final Leg here, there’s just no clear and fair midpoint for an elimination. Oh well. Good luck na lang to the teams. Hehe.